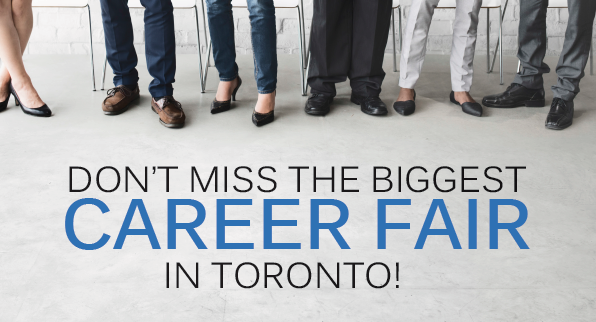 Articles : Open Positions at the Upcoming Toronto Career Fair! Open Positions at the Upcoming Toronto Career Fair! Make career connections at our Toronto Career Fair! Meet with the TorontoJobs.ca Recruitment Team, have your resume reviewed and network with top employers! Our exhibitor list includes: TorontoJobs.ca, Optima Communications, Penske Truck Leasing Canada, Investors Group, Toronto Police, TriOS College, Ministry of Community Safety and Corrections, Oliver Jewellery, Next-Steps Employment Centres, Sherwin-Williams, Royal Canadian Navy, Oxford College, CPA Ontario, Heritage Education Funds, The Chang School, Ryerson University, Skills for Change, Sun Life Financial, Teleperformance, Moneris Solutions, Goodlife Fitness, Robert Half, Career Edge Organization, Canadian National Railway, The Mobile Shop, AltisHR, Financeit, Modern Theory Institute, Citco Canada, University of Toronto Scarborough, Dock Products Canada, PCC Aerostructures Canada, Stephenson's Rental Services, HelloWerk, The Centre for Education and Training, iMarketing, Angus Consulting Management Limited, Dejardin, Aversan, Questrade, First Student, Ziggy Jobs, Volante Systems, Air Canada Rouge, Matcor Metal Fabrication, Airborn Flexible Circuits and many more!